Event news and updates about our craft and gift fairs and Facebook month end craft sales. It’s our birthday this Saturday 15th July and we’re gonna be 7 years old. Can you believe it? Where has the time gone? They say time flies when you’re having fun and I can tell you it sure does. We’ve been steadily growing over the past 7 years and have no plans to stop so roll on the next 7. 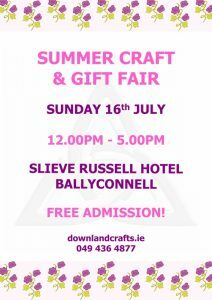 It’s also time for our annual Summer Craft and Gift Fair which is taking place this Sunday 16th July in the beautiful Slieve Russell Hotel in Ballyconnell, Co. Cavan from 12noon until 5.00pm. We have 30 tables full of handmade crafts, quality giftware and craft supplies such as jewellery, soaps, candles, wood crafts, jams, artwork, fabric crafts, greeting cards and free admission. You can see the whole line up of exhibitors on the Facebook event page. We are even getting a visit from the Cavan Rose Paula McPartland who will be popping in to say hello and take a few photos with everyone, we’re delighted to have her joining us. I’m so looking forward to seeing everyone again as well as meeting our first timers, it’s been ages since our last event. We even have a couple of our own craft customers exhibiting so it will be great to put a face to the name. I’ll make sure to take lots of photos as always and pop an album up on our Facebook page so if you’re not able to join us you’ll still be able to see all the fabulous goodies our exhibitors were selling on the day. If you can join us that would be fabulous and we look forward to meeting you so make sure you find us and say hello.